Welsh-speaking magic fans are getting their noses stuck into the Harry Potter adventures for the first time. With Muggles becoming Myglars and Diagon Alley transformed into Y Lôn Groes, Harri Potter sets out on his adventures in Hogwarts and on the Quidditch pitch. 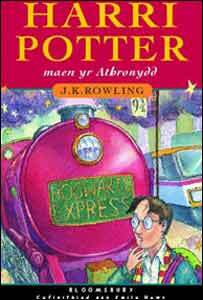 The translated version of the young wizard's debut novel Harry Potter and the Philosopher's Stone - Harri Potter a Maen yr Athronydd - was launched on Tuesday night in Aberystwth, mid Wales. It is six years since the book, written by JK Rowling, was first published in English, and the fifth instalment The Order of the Phoenix has just been released. The novels have now been translated into more than 60 languages, and sold 200 million books, as well as spawning a hugely successful movie franchise. The Welsh version has appeared at the same time as a translation into Latin. It was translated by Emily Huws, an award-winning Welsh author from Caernarfon, north Wales. More than 2,000 copies of the Welsh version have been sold since it hit the shelves at the weekend. Nia Peris, 24, from Cardiff, is already half-way through it. "It is good to have the opportunity to read it in Welsh," she said. "Some of the names have been changed and some haven't - it reads like a natural translation. "I would encourage people to re-read it in Welsh." The Welsh Books Council helped publisher Bloomsbury with financial and translation aid. 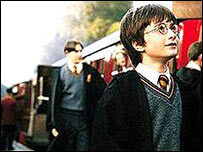 Harry Potter and the Philosopher's Stone was published in June 1997 and has since won a host of awards, including the Nestlé Smarties Book Prize, and the British Book Awards' Children's Book of the Year.